Five years in the making, and after at least six months’ meticulous planning, this was not an auspicious start. Within twenty minutes of claiming our luggage off the futuristically-plastic baggage carousel at Madrid-Barajas, and after spending the few coins we brought with us on a pair of sorely-needed cortados, we stood, incredulous and cash-less, in front of an ATM that had just swallowed our card. A few long moments passed in which I stared open-mouthed at the machine and Amy struggled to obtain an English-speaker via the helpline. I was just about to weep when the girl standing at the adjacent phone accessory booth momentarily stopped admiring her glossy talons and casually mentioned that the ATM-owning bank had an office on the floor above. We hurried, as much as our three suitcases and sleepless trans-Atlantic red-eye allowed, to the silent office, where I, all whey-faced and sweaty, stammered my best approximation of our needs in pigeon Spanish. Believing we were understood, we followed instructions to return to the machine and wait, whereupon a man with the key would join us within a few minutes. Some 15 minutes later, during which we nervously debated whether we had misunderstood the instructions or if the man had gone to the wrong ATM, a kindly, white-bearded gent strolled up and, speaking perfect English, opened the machine and extracted our card. As if in the company of a dim-witted child, he gently guided us through the simple process of obtaining cash. That hurdle overcome, we then navigated the rental of a tiny car with the assistance of a delightfully-gay Mexican before unleashing the snarl of Madrid’s motorway network on our fatigued senses. 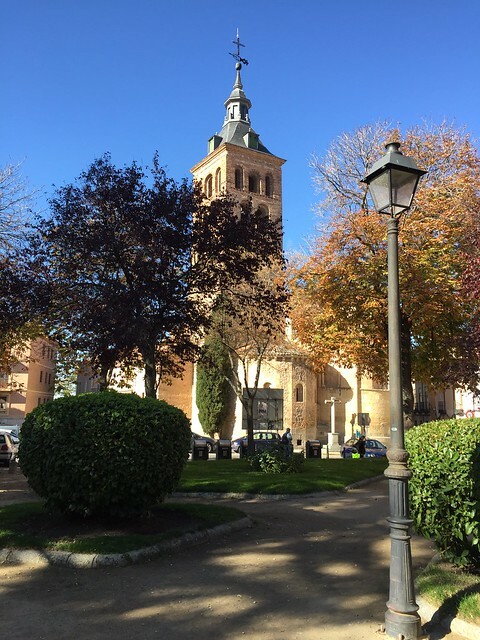 Compared to its magnificent center, Madrid’s suburbs are not only fiercely ugly but depressingly vast, and stretch in one monotonous blur of 1980s concrete and billboards to the base of the Guadarrama mountains. They display all of the character of the strip-mall development along the New Jersey turnpike without any of the slapdash prosperity. The harsh Castilian climate and brown earth mercilessly revealing multi-colored concrete lumps abandoned by the Spanish economy. Driving into the Guadarrama, past the giant cross marking the Valley of the Fallen – Franco’s tasteless monument to those who were killed in the Spanish Civil War – our equilibrium began to return. As we ascended, the blight of the big city began to disappear beneath a grayish haze, and black cattle emerged from the conifers to browse the verges of the road. Then, just as suddenly, we were in Spain’s longest road tunnel emerging 3km later with the even tableland of Castilla y Leon stretching to the horizon. Through dusty fields bordered with dry stonewalls, in which I watched a blue-overalled farmer apply his boot to the rear of an obstinate bovine, we drove into the royal city of Segovia. 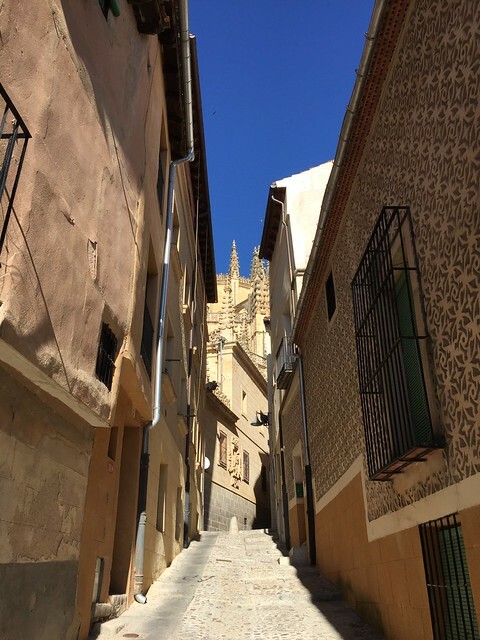 Entered from the east, Segovia is barely distinguishable from thousands of workaday provincial Spanish towns: its stucco walls grimy from bus diesel and its streets plagued by mini-roundabouts and speed bumps. It is only once through the 20th century barrios that her glories are revealed, but to see them up-close, one’s ability to negotiate hill starts in absurdly narrow medieval callejones with a manual gear-box must be proven. 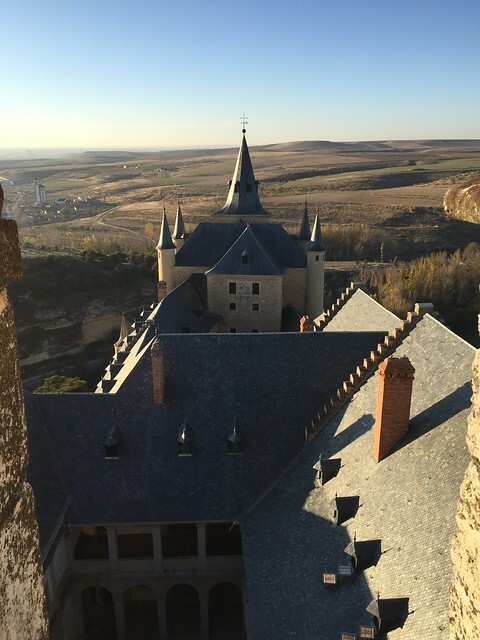 As we wandered that morning, a full-24 hours since having slept on our first vacation without children in more than five years, it’s probably no surprise that Segovia had a dream-like quality. Golden autumnal leaves clung to the trees and above the mist that still hung in the gorge of the River Eresma, the brilliant blue sky accentuated the profile of her caramel sandstone towers in breath-taking contrast. 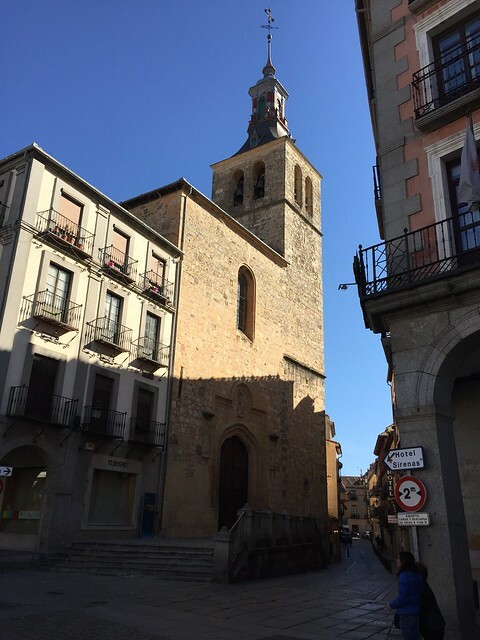 Browsing Segovia’s bustling cobbled streets past more churches than many a town 10 times its size, including the comparatively unobtrusive Iglesia de San Miguel, where Isabella La Católica was crowned Queen of Castille in 1474, the smell of roasting meats filled the air. This wonderful aroma may, in fact, have been behind the noon-time bustling. Such hurried behavior is unusual for the Segovian, who, except when he is behind the wheel, rarely seems to display much affection for haste. 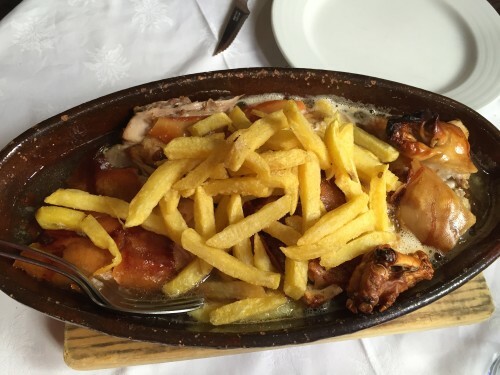 After what amounted to a lap of the compact old town, we followed our noses to Meson Don Jiméno, one among many Segovian establishments competing for the crown of finest roast suckling pig. 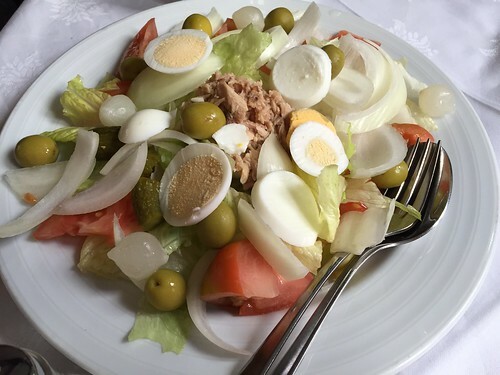 Almost exactly bang in the center of the Iberian peninsula – a territory whose devotion to the glories of the pig is without equal – Segovia has for centuries been synonymous in Spanish gastronomic parlance with this exquisite dish. Those among you who aver meat at the junior end of the spectrum may wish to discontinue their interest in this post, since Segovian pigs are not just young, but veritably tiny, exclusively milk-fed piglets whose flesh has all the pink tenderness of a newborn. Indeed, so supple are these piglets that in the more traditional establishments, of which Segovia boasts several, once cooked to crispy-skinned perfection in oval cazuelas inside wood-fired ovens, and after a lengthy and rather absurd preamble, they are cut into chunks using the edge of a dinner plate. We certainly did not enjoy the richer décor nor the elaborate theater of Meson Candido and Casa del Duque, but neither was our time and money wasted on pointless charades. 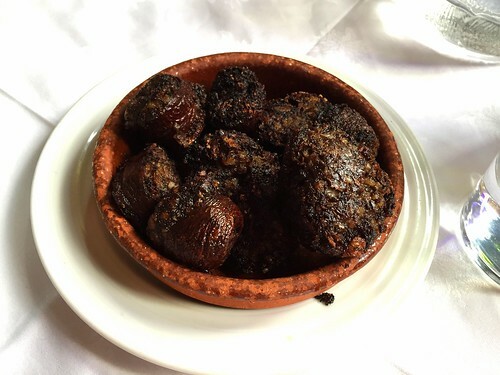 Our goal, to fully suspend any sympathy either for the plight of juvenile swine or for our waistlines in a place as much for Spaniards as we tourists, was achieved once we ordered an immoderate ración of Segovian-style morcilla and the suckling pig for three. We toasted our success with a €6 bottle of local tempranillo. As those of you still reading may imagine, the pork was simply out of this world. I cannot think of a single morsel that passed my lips before that lunch which comes close. When our hostess relieved us of our earthenware dishes, empty save for the small, gnawed bones, she smiled at our gluttony whispering “Suavisimo, no?/super-soft, eh?”. She was right, but it was more than just soft, tender and delicate. It was sweet and frail with the weakness of the womb. Disgustingly so, or it would be, were it not so flavorful, and intensely satisfying. 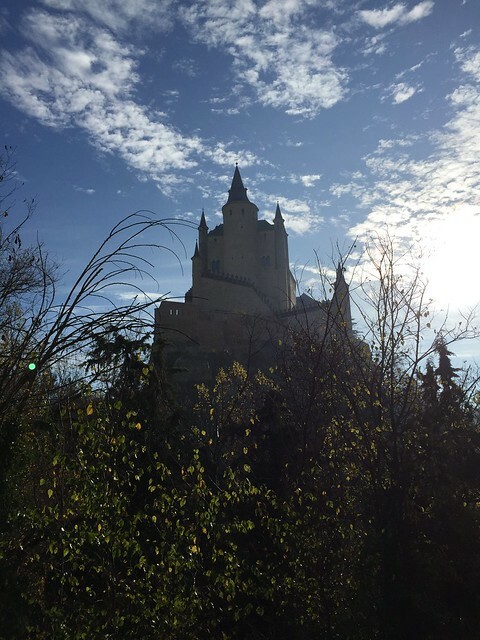 Immune to further moralizing after a thumb-sized shot of local anisette, and made eager by a cafe solo, we strolled into the mid-afternoon sun and onto Segovia’s mighty Alcazar. Perhaps like meeting a childhood idol, finally seeing a building or a scene that you have only previously admired in photographs and imagined from books, can be a nerve-wracking experience. 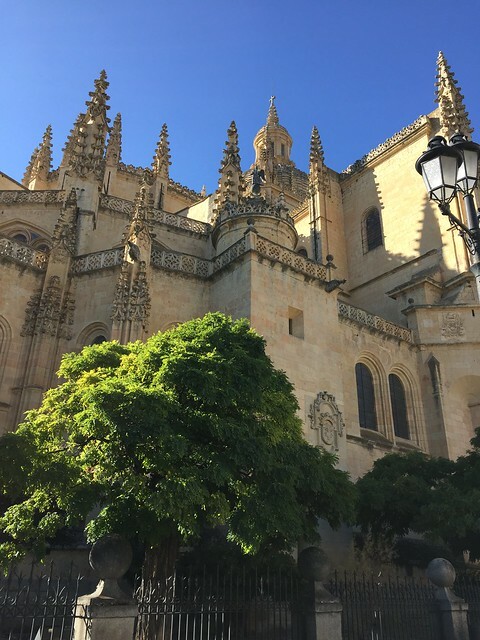 In this case, I had persuaded Amy that Segovia should not just be on our itinerary, but first on the list on the strength of my affection for a book, Segovia in Your Hand, that I had picked up at a yard sale the first weekend after we became suburbanites. Intrigued as much by its pink cover and thick yellowing pages as its inspiring images and hilariously-translated copy, it had been a bedside staple of mine ever since. A source of inspiration that I leafed idly through on many a weary evening, it gradually became a mental talisman against further slumping into the settled life of a working, responsible father of two, and an amulet that, if I kept it to hand, would somehow metamorphose into a long-awaited trip we would take. So, after no more than a four hundred yard stroll, but replete with almost preposterous emotional expectations, I finally stood before the fantastical castle that Jose Garcia Nieto described as Segovia’s “seaworthy prow”, and which allegedly inspired Walt Disney’s Magic Kingdom. The Alcazar, from the Arabic al-qasr, meaning stronghold, is perfectly sited for such a title, sitting on a promontory overlooking the slope of the Castillian plain cut off, save for a narrow causeway connecting it to the city and the Guadarrama at its back, by the deep gorge where the Eresma and Clamores Rivers meet. Entering it across a slim drawbridge that the paunchy security guard made seem even flimsier, felt like boarding a ship ready to cast off and sail across the country, down the Guadalquivir, and on to Spain’s former colonies in South America. Perhaps it was the towers, like the sails of a tall ship, that reminded us of those we saw at El Moro in San Juan, Puerto Rico. Perhaps it was simply the view from the front of the castle that tricked us into imagining ourselves on the prow of a ship, but it’s a peculiar sensation to get that feeling of lightness from a massive edifice cast from and stuck like a limpet to the very stone it sits on. It’s as if the Alcazar could pick up and drift into the air at any moment. It’s quite remarkable. And certainly, the following morning, when viewed from The Convent of San Juan de la Cruz at the bottom of the gorge, it appeared adrift from the city, floating on the mist. 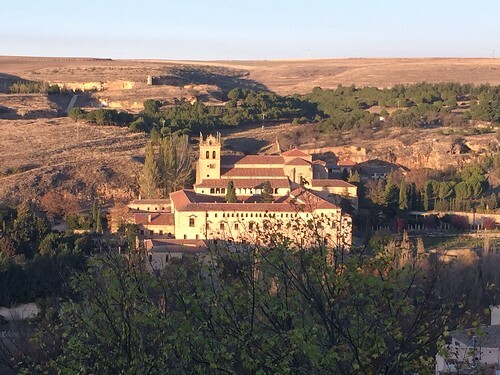 Walking back into the old town, with the setting sun to our left illuminating the city’s towers and casting tremendous shadows on the Monastery of El Parral and the squat Romanesque form of Vera Cruz across the river, the city seemed to come alive again. Peaking through the windows of San Juan de los Caballeros we rested a while and enjoyed the interpretative dance stylings of some of Segovia’s nimblest and most rhythmical citizens before almost accidentally coming face to face with the Roman aqueduct perfectly set in front of the peach dusk sky. 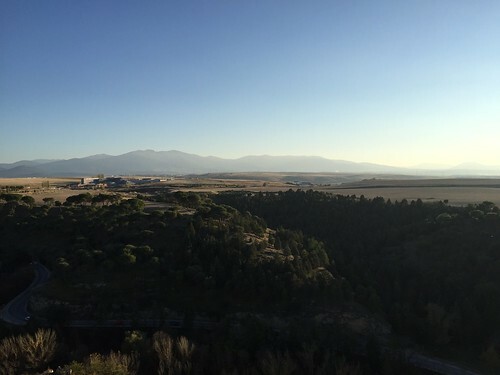 If the Alcazar connects Segovia to the rest of Spain, then the city’s Roman aqueduct connects it to history and to the Guadarrama almost like a vestigial umbilical. Two thousand years and without an ounce of mortar, the aqueduct is still the cord that connects the two sides of the city. 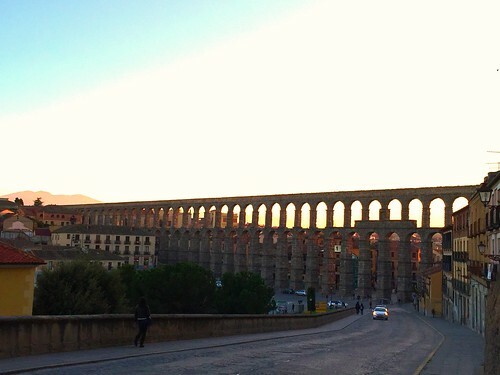 One must have to be raised in Segovia to not be constantly amazed by this towering manmade river bisecting ones hometown, but beneath its graceful arches, Segovians went about their Monday evening business with barely an upward glance. At this point weary with the miles in our legs and struggling to digest the surfeit of what we had seen, we retired to El Sitio for a couple of cold beers which we were delighted to find, this being Spain after all, were served with seemingly nondescript but almost indescribably good tapas. A jumble of fried octopus nestled around a pair of egg-sized potato croquettes dotted with chopped serrano ham; and two tiny rolls with a wafer-thin slice of meltingly tender jamon iberico concealed between toasted and garlic-rubbed inside faces. 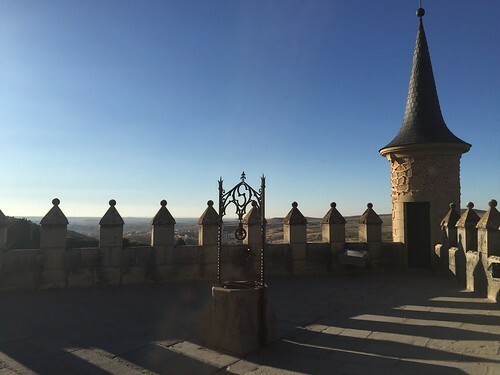 And, savoring momentarily all that the day had offered just before I let myself collapse into one of the deepest slumbers I can recall, I asked Amy whether she thought it had been a good idea to visit Segovia. She replied that if I was prepared to let her have roast suckling pig again for lunch tomorrow, she would agree it had been worth her while. I have to say first of all that the pictures are fantastic. Every one of them. (What camera do you use?) The first one looks a bit like parts of Colorado, desolate but beautiful too, to my eye. 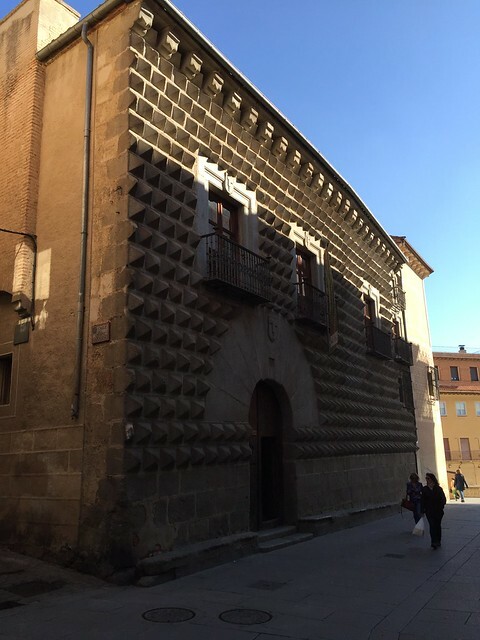 Very unusual architecture in Segovia, for sure, and in a good way. (well, except for that Franco thing)….I thought most of it very interesting and refreshingly different. I may not have Disney’s superior imagination, but the Casa de los Picos reminds me of a bar of Bakers semi-sweet chocolate! And I know you didn’t care for the decor of Meson de Candido’s but I thought it was kind of charming and the quote on the website (“Anyone who honors this house…”) was really pretty cool. Plus the food sounds excellent enough to survive even the heaviest theatrics; it must have been heaven, that suckling pig………I’d want seconds, too, Amy. Really glad that the Alcazar didn’t disappoint–how fantastic it looks, and in very good shape too. I had no idea about the Disney connection. And finally the Acueducto–that would be reason enough to go to Segovia, for me at least. It is just magnificent. I would never ever get tired of it. 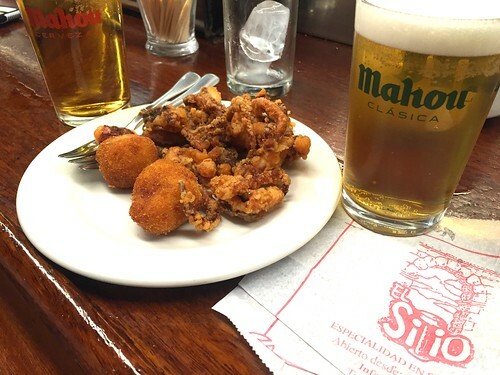 Toss in some fried octopus and a little jamon iberico and I may never leave. Welcome back and thank you for sharing this trip in such a splendid way! @Deborah: you know, it wasn’t that we didn’t care for Meson Candido, per se, it’s more that the theater of the place jacks the prices up, and its reputation meant that it was packed full of Chinese tourists during our stay in Segovia. According to local folklore, underneath one of the points on Casa de los Picos there is a hidden treasure though the art students smoking outside (it’s now a fine art school) didn’t seem very interested in that. We’ll definitely be returning to Segovia. We had many an idle conversation that it would be a great city to have a second-home in. Of course, we’ve found quite a few places like that over the years. 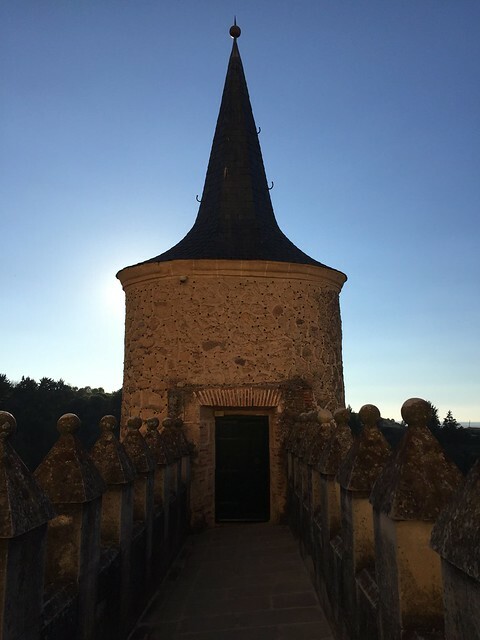 If money was no object, so far, we’d have a home in Vieques and Ponce, Puerto Rico, one in the Basque Country, another in Segovia, a modest pied a terre each in Madrid and Barcelona, a simple flat in Montevideo, Uruguay, and a farmhouse in the Umbrian hills. Plus, at least, two more lifetimes to spend time in them… Oh, and you might be disappointed to hear that we took all these pictures on our phones. We couldn’t find the battery charger for our good canon SLR before we left, so had no choice. Happily, Segovia (and the other places we visited) are so photogenic that even hacks like us can take decent shots with a smart phone. @Deborah: How did the duck go? We rotisseried a pair of ducks for Christmas Day dinner, and they were, well, delicious. 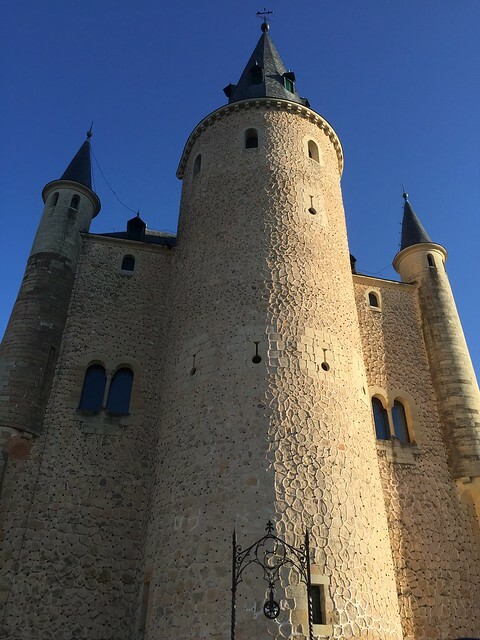 We may be better than average photographers, but in Segovia, all you have to do is point your camera at something, especially with the cornflower blue sky above, and you can look like an expert. It really is that beautiful there. New post on some of the rest of our trip coming later this week. Duck was great–thanks to Very Simple Roast Duck recipe by Melissa Clark. Her video is as funny as it is useful, esp. for first time duck roasters like me. Looking forward to the next trip installment with lots of pretty pictures, I’m sure! Looked like an amazing trip! Some of those old buildings and architecture are pretty incredible! Hopefully one year we’ll be able to get over to Segovia! haha! @AShley: thanks! It’s an incredible city. All of that in about two square miles. It’s compact and full of treasures.